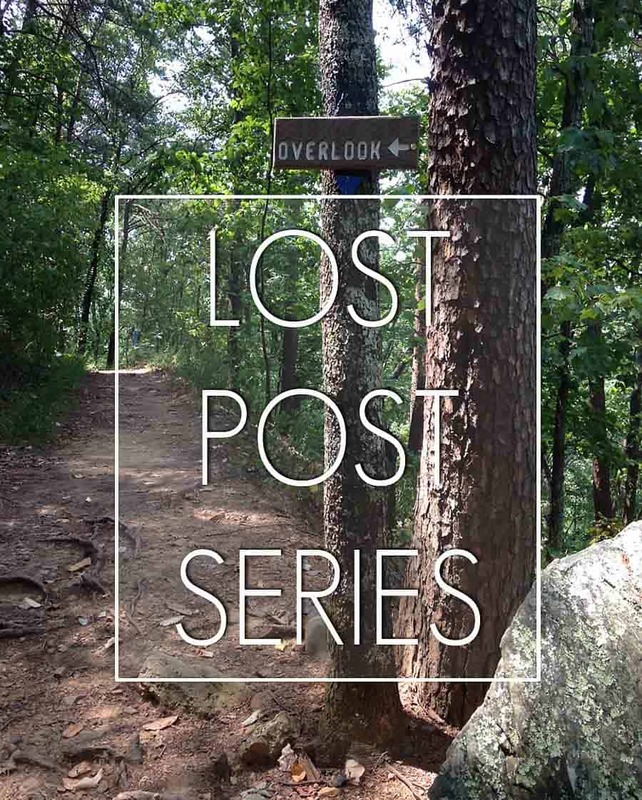 I’m back with another installment of the Lost Post Series. Although, now that I’ve edited the photos I realize why this post was set aside. Well, there might have of been one more reason as well. I’ll get to that at the end. The driving factor for posting this, despite the photos, is that it was very popular on my Furniture tab. Most of the comments on that page were regarding this piece of furniture. I felt that now that the comments are gone from that tab on the new site, it was only right to create a to step-by-step instruction in an actual post. Here’s the image that garnered so much attention. My friend hired me to paint this whole room of furniture the summer before we moved. 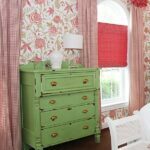 It was already a gorgeous room, but with the new paint finishes it became a true knock-out. 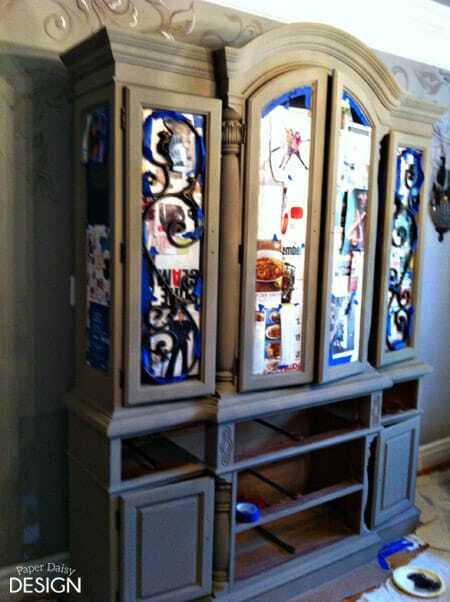 I don’t think either one of us could have predicted how perfectly this hutch was going to match her hand painted mural. Here’s a look at the before of the hutch and you can see a peak of the chairs too. 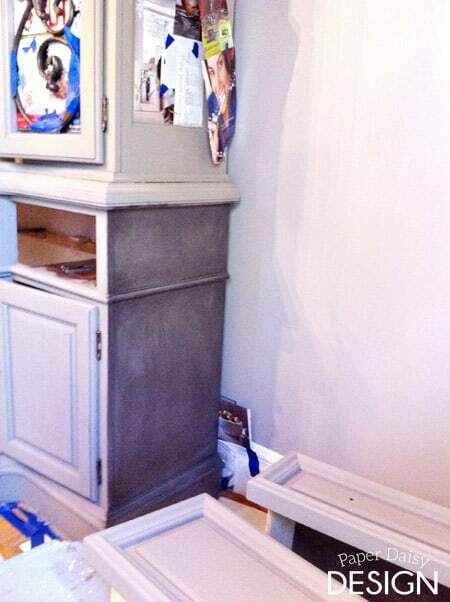 After 2 coats of Coco Annie Sloan Chalk Paint it looked like this. You can see I inserted magazine paper to cover the glass in addition to tape. In some places this worked out great, in others it was a nightmare to get the paper out from under the wood. Not sure I’d recommend this idea. To give the piece more depth and just a bit of sparkly essence, I added Martha Stewart Metallic Glaze in Black Coffee. NOTE: THIS PRODUCT SEEMS TO BE DISCONTINUED. I think I have found a possible replacement. HOWEVER, I have NOT tried this product. I just wanted to share because it seems to the same product, repackaged under a different brand. Here’s a link for your convenience. I used a inexpensive 3″ natural haired brush to “paint” on the glaze in an even coat. 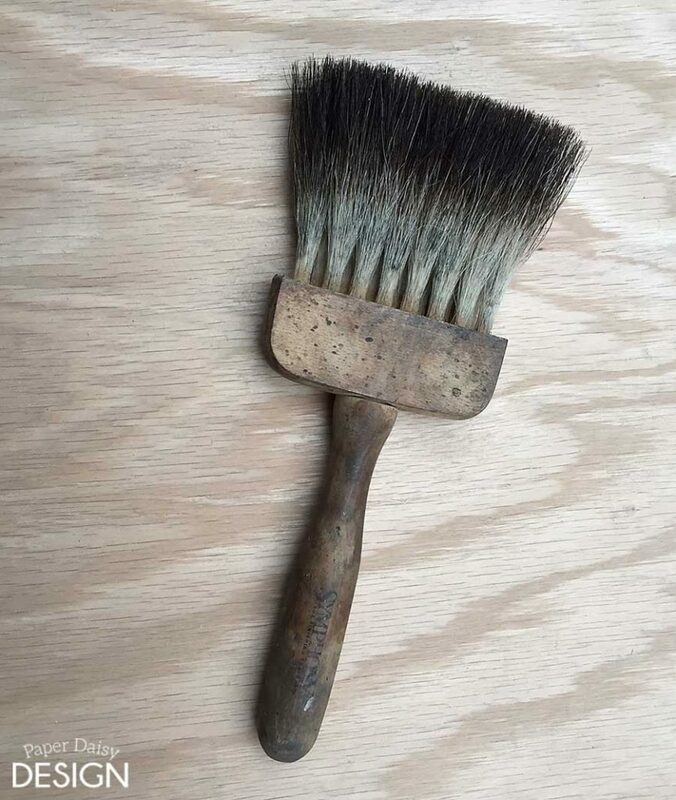 Then with a faux finish brush like this one, I feathered the glaze out. Kind of like working the glaze into the paint, using a sweeping motion in both directions, working in about 1 foot sections. I kept paper towels handy to wipe off the faux finish brush often. After one coat of glaze it looked like this. I let it cure for over the weekend. Once I went back to the piece I realized, thankfully, that the glaze provided plenty of protection for the paint and did not require any further top coat. I also used this technique on the base of the table. I’ll go ahead and mention the technique I used on the dinning chairs because they received an entirely different finish. 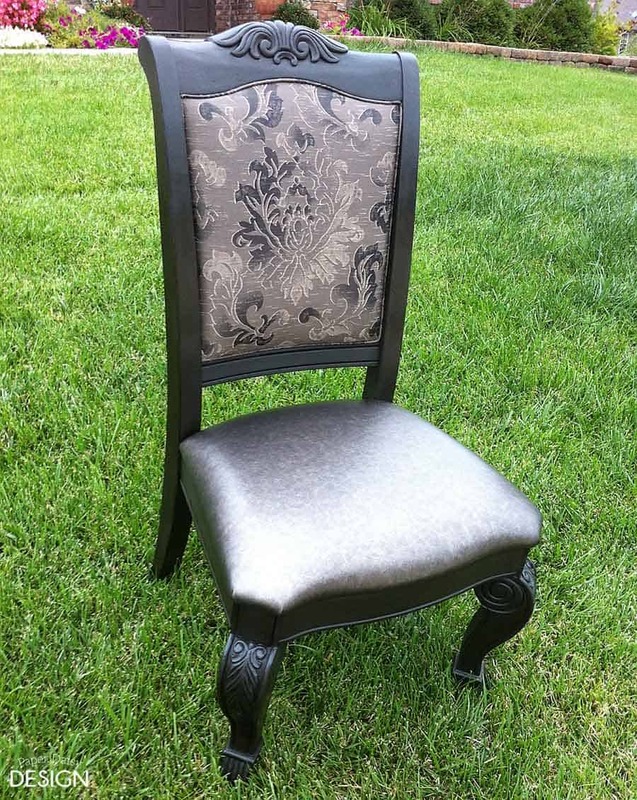 First, they were painted with Annie Sloan Chalk Paint in Graphite. Then, to warm up the color and match the tone of the fabric more closely, I applied straight Annie Sloan Dark Wax. I will tell you that it took at least a week for the tackiness to go away even after much buffing. This is because it was a rather heavy coat of wax. Once it cured it had a very nice smooth finish. Now I’m going to insert a bit of the Q&A that went with that post. Q . 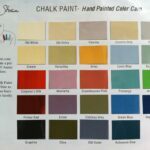 Do you apply the glaze over the 2nd coat of chalk paint or did you apply the wax made for chalk paint first? I tried applying the Martha Stewart black metallic glaze over chalk paint and it doesn’t seem to do anything. I am wiping it with a damp rag after applying, am I doing something wrong? A. I did have to use two coats of chalk paint. If you wipe the glaze off it will be too light and only fall into the grooves of the piece. Sometimes that is the look you want, but in this case we wanted a more overall finish. As I said, I painted on the finish and then used the faux finish brush almost as if I was sweeping the piece leaving a soft haze of glaze behind. Q. I’m looking at the big hutch with the Coco ASCP and Martha Stewart Black Metallic Glaze. It looks gray not coco. Was the coco gray or brown tone? I’m trying to achieve a gray and wondering if this will work for me. A. In the photo, the walls were so close to the Coco color it appears a little washed out. I can best describe Coco as a dark greige. 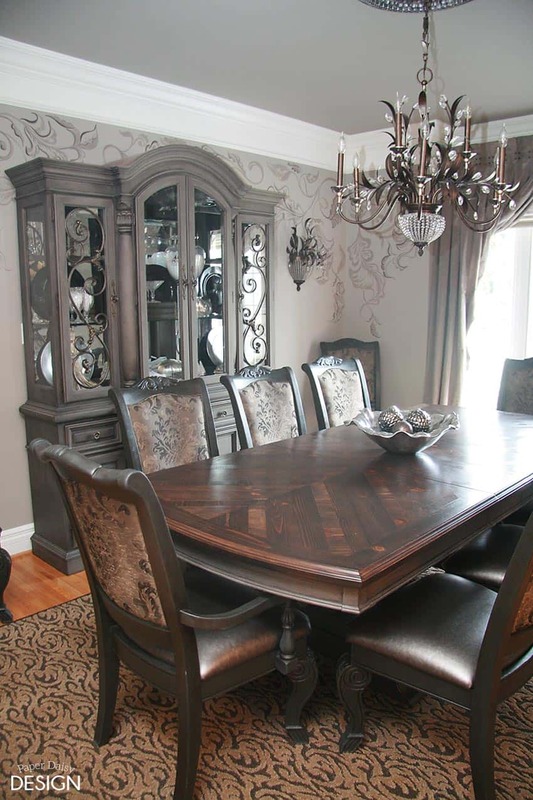 It is definitely more brown than the color French Linen from Annie Sloan. Hope you enjoy this lost treasure of post! To say this was an enormous job is quite the understatement. So the other reason I probably let the project go without a mention had to do with the fact I was so done with this project! Want to see more of my Furniture Flips? Click here. Wow! That furniture looks so beautiful. 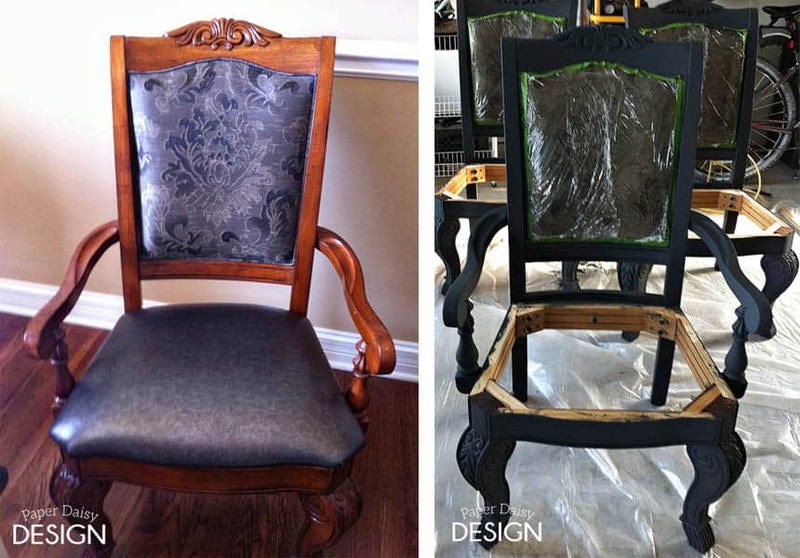 You do awesome refinishing work! I’ve always wanted to learn how to refinish furniture, but just have never had the time. You’ve definitely stirred up some inspiration 🙂 Thanks for sharing! This is so beautiful! Really some good work here! Great job! I know this was a huge project! Turned out perfect! I love this piece! I can’t wait to try out your technique! 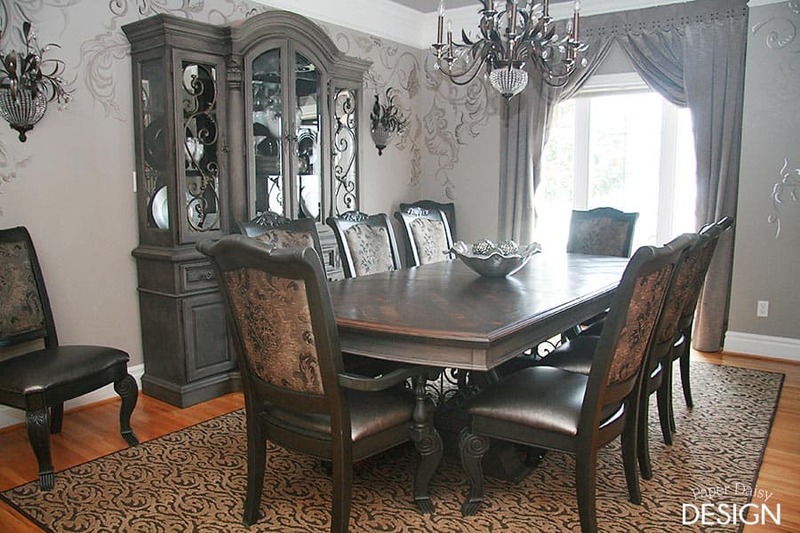 Hi i LOVE this dinning room, i was wondering about your walls are those decals or did you paint the pattern on them 🙂 if they are decals where did you get them, So beautiful! 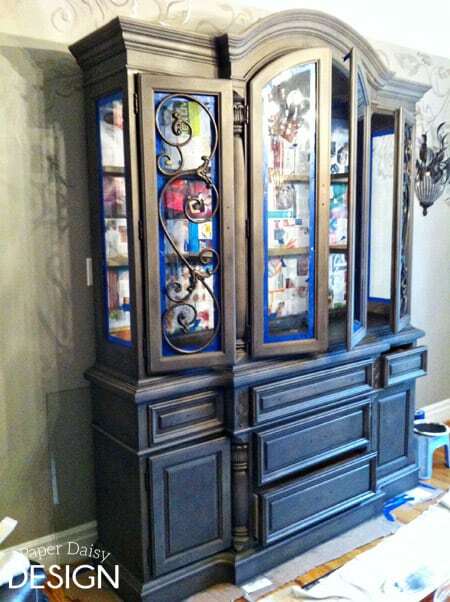 That hutch is stunning! 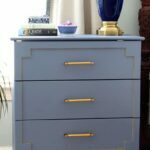 I just finished painting an old buffet with two coats of Cocoa and went online for ideas as to how to finish it and now I’ve found it! I do have a question for you though. When painting pieces as large as that hutch do you paint by hand or do you spray paint? I bought a sprayer recently but haven’t tried it yet. I have a sprayer that I like now and I actually just shared information on it here just recently. But when I did this piece I didn’t have a sprayer and with chalk paint, generally you want a hand painted look. Unfortunately, this particular glaze has been discontinued and I don’t have a product to recommend. Sorry! Hi i have a question! First this is beautiful!!!!!! Second i want to recreate this with my bedroom furniture, but the martha stewart glaze has been discontinued i see 🙁 any other options of glaze that would give the same look? thanks for your helpful post! This all looks great! 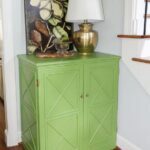 Question, did you sand the hutch or strip it before applying the 2 coats of chalk paint? I’d like to avoid a lot of sanding/stripping and want to re-do our bedroom furniture, just like this. did you apply wax before the metallic glaze? Wondering the same thing. Did u get a reply? I did not wax at all. Neither before or after. The glaze created a nice, finish once it cured about a week. The link is not to a glaze. It is a metallic paint. I didn’t even pay attention and when I made the first swipe, I knew there was a problem. It should work as a glaze as well. I used just a small amount working it in over an area with the brush above. It’s always a good idea to work on a sample board first. Hope this helps. I was wondering if you added the glaze while the paint was completely dry or still a little wet. 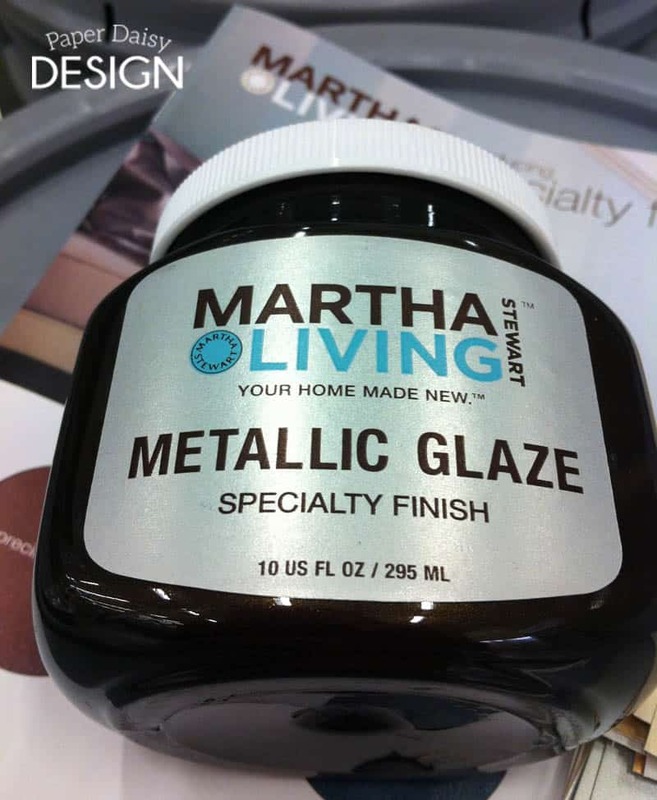 I was able to find the Martha glaze you used and mine is coming out very dark and not like the light grayish look you had. Any suggestions? The paint was definitely dry. Like several days dry. It is very much an application and a removal process with the glaze. Glaze really never is painted on. Try offloading your brush on a plastic plate and then use a rag or the faux finishing brush I mention to remove excess paint and leave just a hint of the glaze. I’d love to know where you found this glaze so I can direct others. what did you do about the hardware? It looks like it was highlighted with white over the dark glaze, or is it just the light shinning on the piece. Very beautiful piece, I am going good to try to apply something similar to my old kitchen cabinets. Thanks for sharing. I think what you are seeing is the metallic reflection of the glaze I used. It was fairly subtle, not shiny metallic but enough to give it a bit of glamor. You seriously should win some kind of award for this! Not just because of the finished product, but because of all the hard work! I live in Houston where there are high end furniture stores every few miles. This is better than anything you’d find on their sales floor. Cudos for perfection! Oh, Thank you! What a compliment! 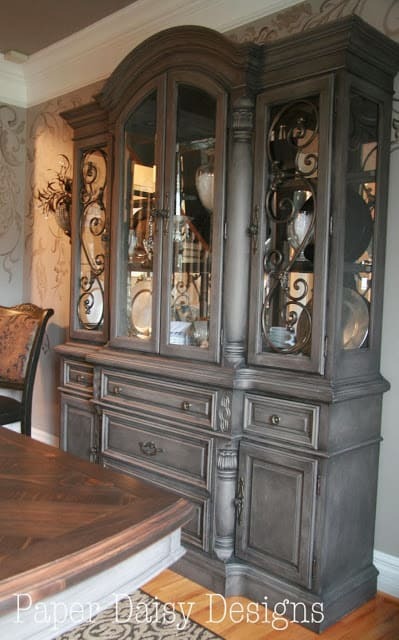 Do you know the brand of the hutch and table? I would like to try and find them or something similar. I’m sorry I have no idea. It was my friend’s piece and I have moved away. Wish I could be more help. I can’t find the glaze any where. Can you help me? In my post I shared this affiliate link to Amazon. I have not used this product but it appears to be exactly the same. The Martha Stewart one is not available at Home Depot anymore. I have purchased the Amazon suggested metallic paint and it seems bronze to me. Nothing grey about it and will give a very much brown look. Just FYI. It is going over the coco color. Be sure to work on a test board first. They could have changed the formula. Please let me know. Also, heed the directions that the glaze is applied very lightly. Almost completely wiped off with the faux finish brush. My daughter helped me repaint a hutch that I inherited from my husband’s family. I saw your post and wanted to try the same color combination. We finished the two coats of the Annie Sloan coco and I ordered the metallic paint from Amazon that is supposed to arrive tomorrow. I am so excited to see how it comes out. The hutch is not as large as the one you did but, it has some metal pieces on the glass in the side doors. Is there a way I can send you a picture of it when we are finished? Thank you for the idea. I have never loved the style of the hutch and it was so dated. Hopefully, this will make it a beautiful piece. So, after the two coats of coco and letting it dry for two days, we tried the metallic rich espresso paint. It is just coming out a gold color. Nothing like the the grey dark tones on the pictures that you have. I guess we need to try another color of metallic paint. I really don’t like the gold with the coco. I think the problem is the link that is in your post is to a paint not a glaze. I think that is the problem when trying to apply it as a finish. The paint is covering to much. I think the link was supposed to be for a glaze not paint. I am loving the look of this room. 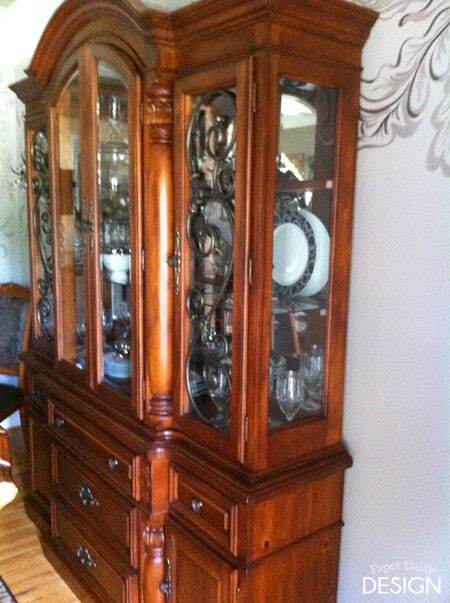 A beautiful job on that hutch! 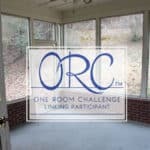 I’m trying to recreate the look of the room and was wondering if you happened to know the color of the wall and ceiling? It’s the exact look of what I’d like in my dining room. Any help would be appreciated. I am sorry I do not know the wall color. I’ve since moved away and this was my friend’s house. Hey I’m just wondering what the height and width is of this hutch? Beautiful piece! I want so bad to do this to my hutch but am scared to death ! This is beautiful ! !